Freezing corn on the cob is a great way to preserve the taste of a hot summer day for the dead of winter. Sweet corn on the cob has a short peak where it is at it's best, after awhile it starts to lose it's freshness and sweetness. 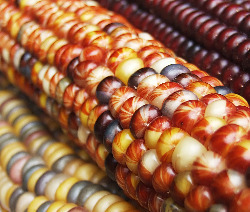 Freezing is one of the best ways to preserve corn's taste and texture. The simplest method of freezing corn on the cob is to put it husks and all straight into the freezer. The husks even prevent the kernels from getting freezer burn. However, the best method is to shuck and blanch it first. 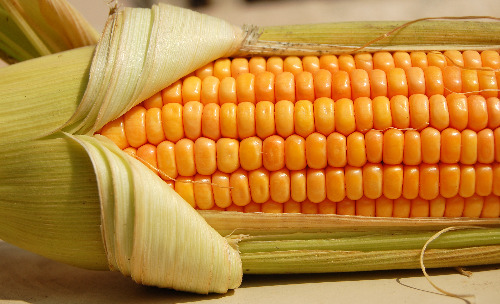 Blanching kills enzymes and helps the corn maintain it's sweetness, firm texture and vitamins. 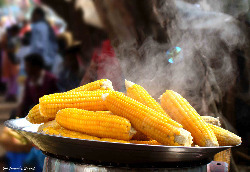 Blanching times are 7 minutes for small ears, 9 minutes for medium ears and 11 minutes for large ears of corn. Cool your corn for the same amount of time you blanched it for to prevent over cooking. Then place in freezer bags, label, date and add to your freezer inventory sheet. Microwave: From frozen, with 1/4 cup water in a covered dish OR wrapped in a damp paper towe, turn once half way through and cook until heated, about 2 minutes per ear on high. Times will vary based on the power of your microwave. Oven (or Grill): Preheat to 425 F (220 C). Brush frozen corn on the cob with butter and wrap in foil then grill for 25-35 minutes on top rack over a pan, on lower rack, to catch any drips. Keep door (or lid) closed as much as possible and turn occasionally. Stovetop: Boil corn until heated through. This method works best if you thaw the corn first. Swap freezer recipes with other foodies. Or return from Freezing Corn on the Cob to your freezing food guide homepage.